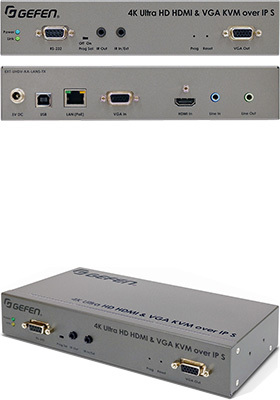 Gefen 4K Ultra-HD HDMI & VGA KVM over IP extends HDMI, VGA, USB, 2-way audio, RS-232, and IR. Input resolutions up to 4K 60Hz 4:2:0 and HDR, and output resolutions up to 4K 30Hz 4:4:4 are supported along with HDCP 2.2 and 1.4, and 7.1 channels of HBR (High Bit Rate) lossless and LPCM digital audio. 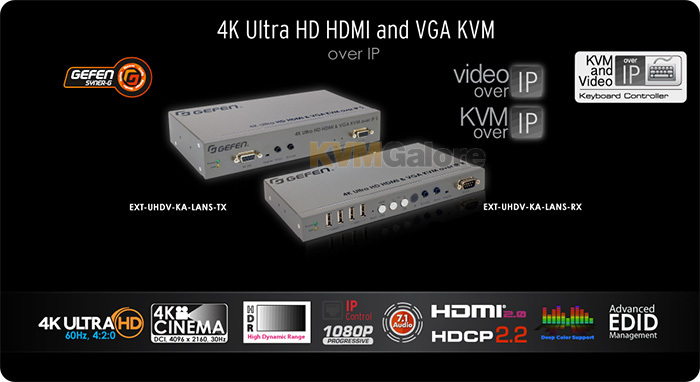 Gefen EXT-UHDV-KA-LANS-TX and RX feature HDMI and VGA inputs and outputs, and can support DVI when using Gefen HDMI-to-DVI cables. Sender unit also features a VGA output for local monitoring of the source. 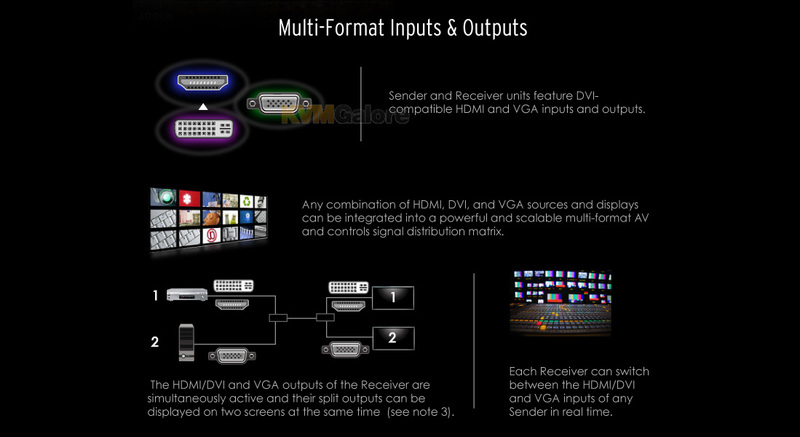 The VGA input and output support VESA resolutions up to 1920x1200 at 60Hz (WUXGA). RS-232 and 2-way IR routing between the Sender and the Receiver units allows the transfer of IR commands and RS-232 communications among all sources and the displays. • PoE (Power over Ethernet) allows the new Sender and Receiver units to be powered through a standard PoE-enabled IP network switch, without the need for external power supplies. • The video wall controller that is built into the Receivers accommodates any screen configuration up to 16x16 and provides great flexibility in sizing and manipulating live and signage content in demanding installations such as sports bars and restaurants, or in corporate, education, hospitality and retail establishments. • Digital and analog audio break-out allows the audio from the HDMI output to be sent to a separate audio system, enhancing the impact of presentations in large venues. • USB routing and the Receiver's USB hub with two USB 2.0 and two USB 1.1 ports accommodate touch panels, keyboard and mouse, and a variety of supported USB devices. This feature, along with analog audio inputs and outputs, make these products perfect to use in collaborative and interactive installations. When used in conjunction with the EXT-CU-LAN Matrix Controller, system configuration is automated and quick. 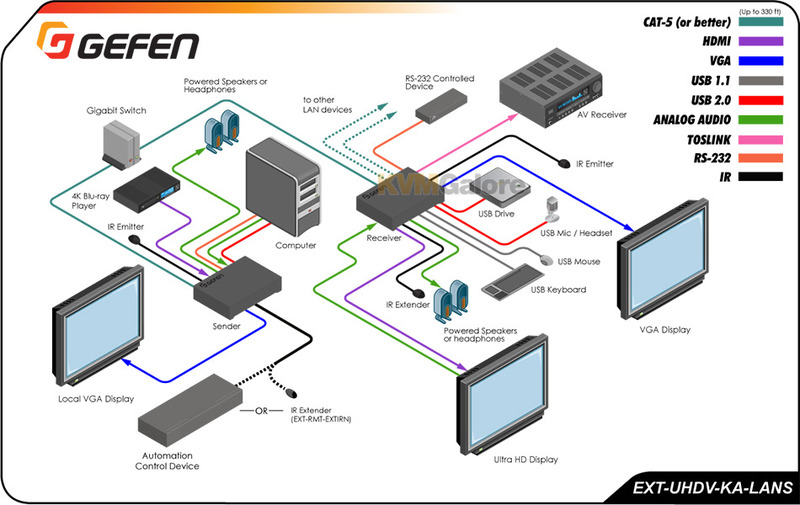 Enhanced network security by separating the control and AV networks is also made possible when used with EXT-CU-LAN. Other control options include front panel buttons, web server interface, Telnet, UDP, and the Gefen Keyboard Switching Controller software. Each cable run from a Sender to a Receiver or from a Sender or Receiver to the network switch can be up to 100 meters (330 feet). A built in 3-port Gigabit switch on each receiver allows the connection of additional receivers, providing daisy-chaining functionality. 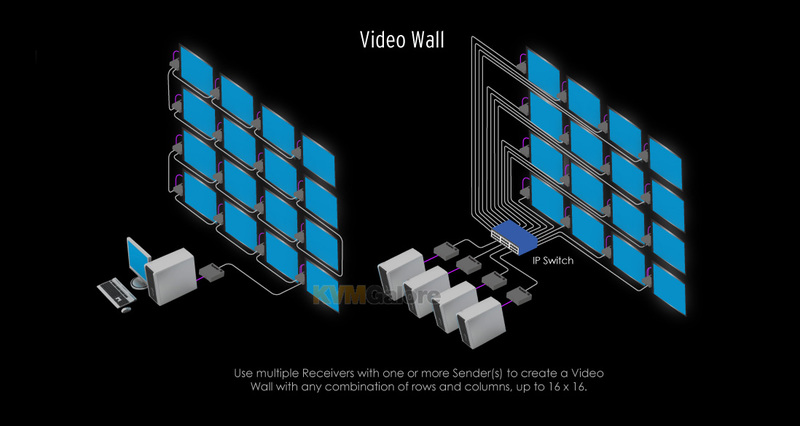 In applications such as digital signage, where there may be a need to replicate content on multiple displays throughout the installation, the ability to cascade receivers essentially removes the requirement for a cable to be connected directly to the main network switch, thereby extending the range of these units far beyond the limits of a point-to-point video distribution system. The Sender and Receiver can be used as KVM extenders in a one-to-one system, or as nodes in a virtual matrix environment with a combination of just over 65,000 Sender and Receiver units where any source can be routed to any or all displays. The Sender features a 1U tall and half-rack-width enclosure, perfect for rack mounting using the Gefen EXT-RACK-1U-GRY rack tray (available separately). It can also be surface mounted or be placed on a shelf. The Receiver is also rack mountable using the rack tray, can be surface-mounted, or can be placed on a shelf. When used with the included IR Extender module, this low-profile unit can be hidden away behind a display or in the equipment closet. Listed below are additional products to consider which are compatible with 4K Ultra-HD HDMI & VGA KVM over IP, Sender. These items may be required to complete your system.